These Candy Crush Jelly Level 119 cheats and tips will help you beat Jelly Level 119 of Candy Crush. 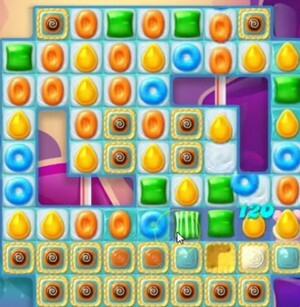 The objective of Candy Crush Jelly Level 119 is to crack the frosting and find 4 pufflers in 27 or fewer moves. In Candy Crush Jelly level 119, try and eliminate Pies as fast as you can and it is advisable to commence with two groups of two Pies at the middle of the playing field so that it can be easier for you to make special candies. Eliminating the candies will allow the availability of more candies on the gaming field and increase the area in which you can make special candies. After you have eliminated some of the Pies in the gaming area, and with the availability of candies of four colours in the playing area, you should not have a lot of difficulties in making special candies. In Candy Crush Jelly level 119, it is advisable to hold on to the special candies until you combine them due to the combination’s enhanced effect.